Here’s another recipe that I love with some great fall flavors. Pomegranate, balsamic, and whole grain mustard come together in this glaze that is flavorful but will not overpower the fish. Super simple to make and a sure crowd–pleaser, this recipe is perfect for a quick dinner on the nights leading up to Thanksgiving. 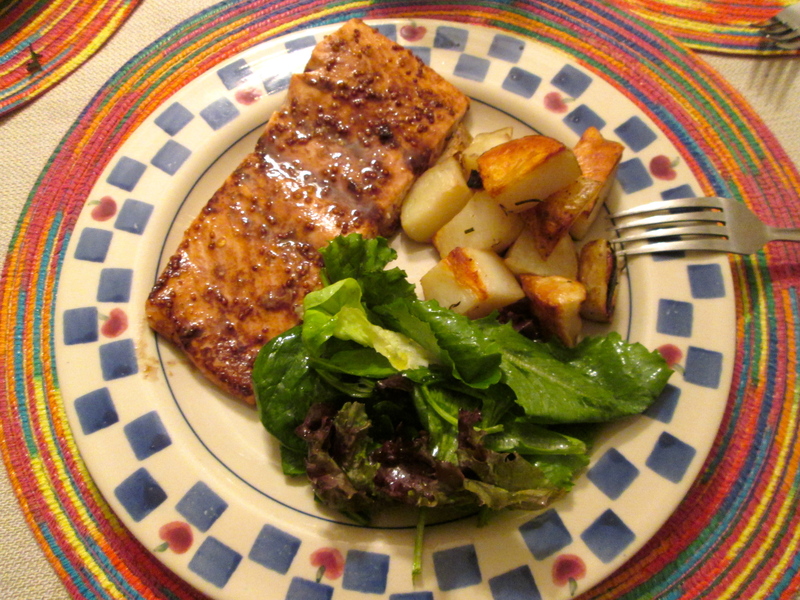 I served the salmon with some potatoes I roasted in the oven on 425 with chopped rosemary, chopped garlic, and a little olive oil and salt for flavor. To add some greens, I tossed a simple salad together and served with the salmon. Easy, flavorful, and filling, just how I like my fall meals. Healthy, flavorful, filling. A Great combo. If desired, toss some cubed potatoes with chopped rosemary, salt, olive oil, and some chopped garlic and throw in the oven for about 40 minutes. Make the glaze: Mix about 2 teaspoons cornstarch, 6 tablespoons light brown sugar, 6 tablespoons pomegranate juice, 4 tablespoons balsamic vinegar, and 2 tablespoons mustard with a pinch of crushed red pepper for some heat. 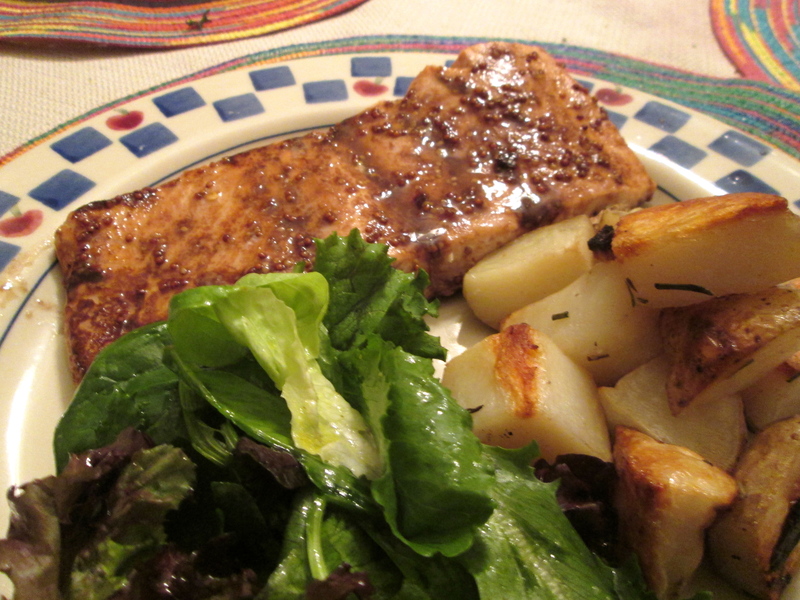 When the potatoes are almost done, glaze the salmon and place in the oven for about 10 minutes, or until the glaze is sticky and the salmon cooked through. 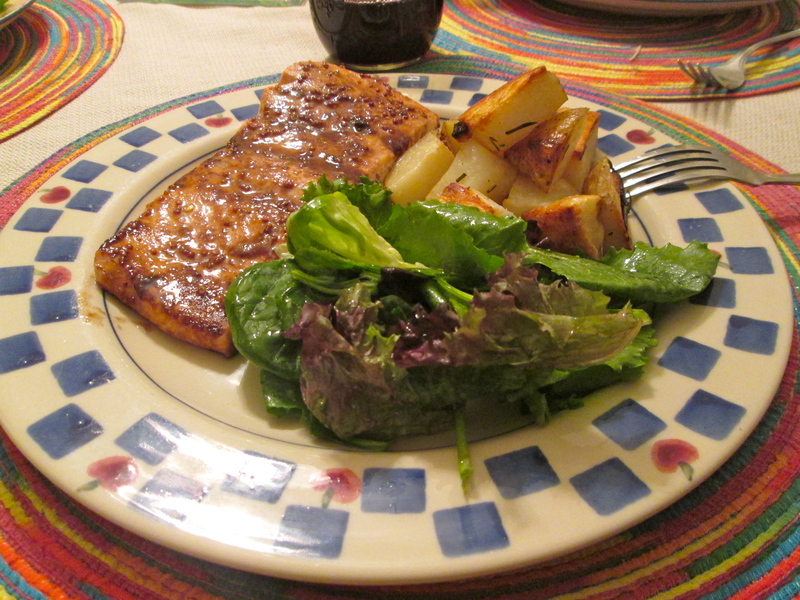 Serve with the potatoes and a salad, if desired.